Originally published 6/21/17. Updated 2/6/19. There are no winners or losers when it comes to pizza, except of course, if you aren’t eating it. We’ve been pretty tense lately Columbus, I know. People have been taking all sorts of sides when it comes to the food debate. Whether it’s the best fried chicken, or the best burgers, or the dopest restaurant dives, we’ve been pretty divided as a city. And most of that’s my fault (I’m not apologizing for getting unreasonably upset about food, that’s my Ohio given right, so chill). What I will do is list a bunch of pizza places that are all really good so no one can really argue about which is best (you probably will anyway). So relax Columbus, everyone on this list gets an award and they’re all winners (Sort of). If you want to prove just how cool you are while downing a pint and a half of obscure craft beer then Yellow Brick is just what the strongly opinionated barista ordered. 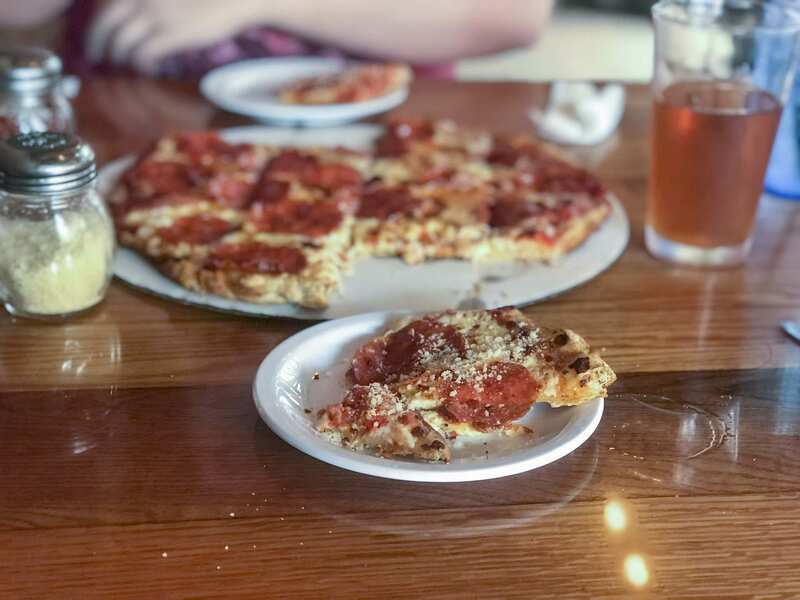 Located in the heart of Olde Towne East, this chic pizza joint offers some pretty incredible pies and awesome beers, all with minimum scoffing at your vinyl collection. Seriously bro, how you about to own Nine Types of Light and not Return to Cookie Mountain? Ah, Hound Dog’s, the only place where you can find tattooed biker types shoulder to shoulder with office and tie squares. It’s like they saw Roadhouse for the first time and was like ‘Yes, that’s our business model’. But here’s the crazy thing, it worked. I love a good dive as much as the next person and the only thing that could make that any better is an awesome pizza, which they are more than happy to supply. Their Smokin’ Joes crust is flipping amazing and worth traversing the bar’s dark interior to try. I wish I could say there were a lot of Chicago-style deep dish spots in the capital city, but there just aren’t. Fortunately, Giordano’s popped up recently to fill a gap that I didn’t even know needed filling until I tried it. This wise guy moved in on Columbus turf and set up shop, offering a deceptively light and flakey crust for a deep dish. I’m not one to appreciate anybody muscling in on my scene but Giordano’s puts together an offer that nobody can refuse. Plank’s crust is the source of some contention. Rather than a savory or bland crust, Plank’s prefers to give them a little of the sweet stuff, setting it apart from most pizza places. While a lot of people embrace that sort of thing, many more call shenanigans. Don’t be afraid to embrace that sweet side, pizza doesn’t always have to be a bitter, meat fueled, man fest. If you really feel that bad about it, you can always listen to Master of Puppets while watching re-runs of NCIS after you eat it. I won’t tell anybody. Tommy’s Pizza is famous in the Columbus area, especially their regular pepperoni pizza. I can almost imagine those little saucers full of grease right now, all delicious and yummy and stuffing my arteries like a Thanksgiving turkey. High blood pressure is but a small price to pay for the city’s best pepperoni pizza. What does a doctor know anyway? Nothing about pizza, that’s for dang sure. If you don’t know you better go and ask. Mikey’s Late Night Slice is life-saving, with many a medical journal writing on the curative effects of it’s Unicorn Sauce. After a night of throwing back enough whiskey to kill Gerard Depardieu when he still had a functioning liver, Mikey’s has been known to rescue people from certain destruction. Not only that but it also prevents you from explaining the Point Break The Musical Screenplay you’ve been working on to complete strangers. In a related note, if anyone happens to know what Mikey’s tastes like while completely sober, I’d love to do a human interest piece just to figure you out. Almost everyone has a memory of being on OSU campus (either as a student or as an avid fan of partying) and ordering Adriatico’s. A Buckeye size from this place is enough to feed an entire apartment complex (well, almost, I’ve seen it happen). Whether you’re hosting a shindig, a community service event, a tiny desk concert, or very a small rave in Nationwide Stadium, Adriatico’s has you covered to feed all those famished mouths. Not only is La Tavola one of the best Italian spots in the city, it also makes a mean pizza. And these pies take themselves seriously. They’d have to with toppings like prosciutto, arugula, blue cheese crumbles, pickled sweet peppers, freshly made sausage and so much more. You’re not going to be disappointed with their specials for the day. These pizzas are so serious they make Robert Mueller look like Jim Carrey. Yeah. That serious. If you didn’t know that Columbus has its own style of pizza then kindly leave now. That’s right, the door’s right over there. I’m sure Cleveland will put up with that sort of gastro-treachery but here, in the great hometown of Lil Bow Wow and Josh Radnor, we have a little more respect for ourselves (*unmitigated sobbing*). 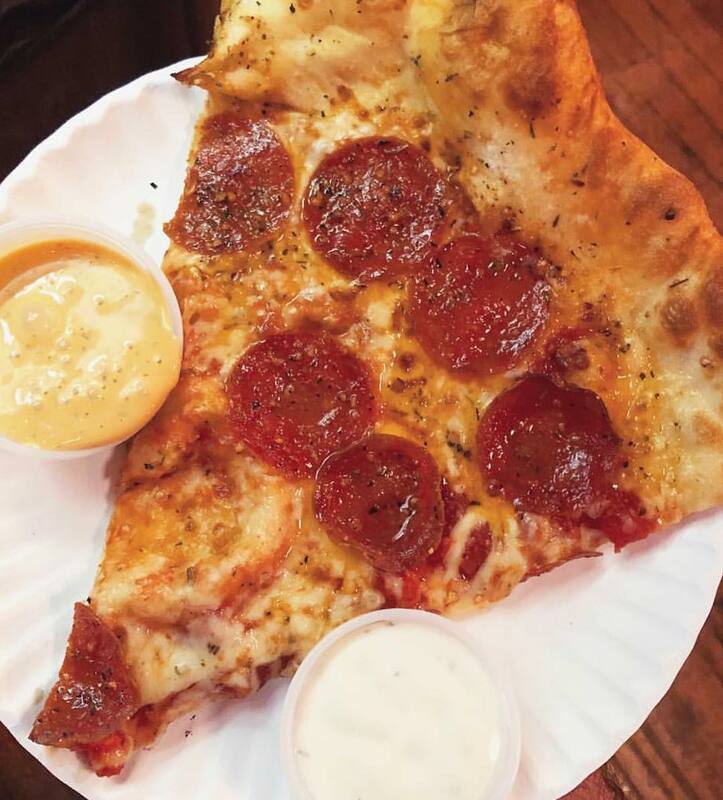 Columbus style is defined by its thin, crunchy crust and its abundance of toppings that crowds the pizza’s edge. A lot of places put out a great Columbus-style but Rubino’s is the best. Donato’s, you get an honorable mention but Rubino’s has been rocking it steady since its inception. With coal-fired pizza all the rage these days, there are a lot of places laying down some heavy competition, but none do it like Natalie’s can. Not only that, but the place is also a great music venue in the city. You got artists crooning everything from Folk to Blues to Jazz, almost assuring that you’re going to be at least somewhat sad while you eat your pizza. Oh shush now, there’s nothing wrong with a little melancholy with your meal. Enjoy the awesome pies and let those tears flow free, everyone deserves a little maudlin angst here and there.